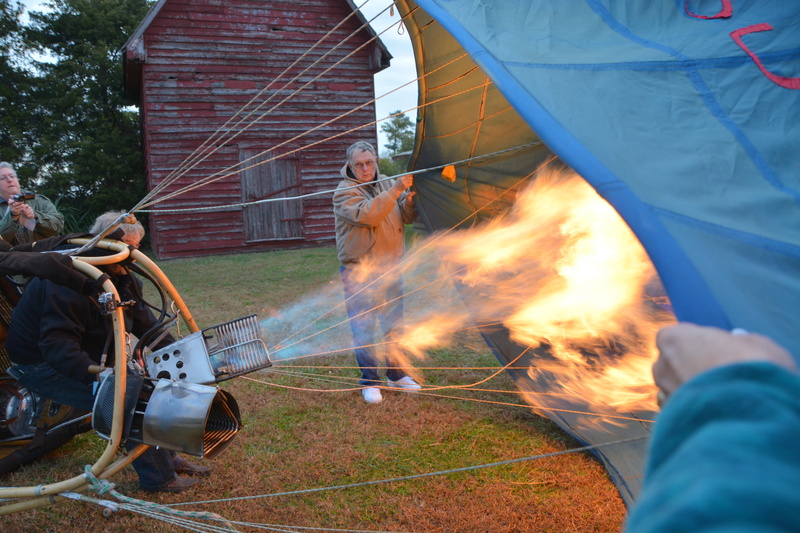 This entry was posted in Traveling Days and tagged hot air balloon launch. Bookmark the permalink. You and Motor Man always manage to be in the midst of the adventure. Not surprised MM had made an instant friend of the owner…he does that with everyone!! We saw the balloon when it flew over our house. Couldn’t figure out what the mysterious sound of the flame-burst were until it came into sight. So neat to have this flying around the town. Great story! Great photos……we love watching the balloons launch – we’re right across from a school yard which frequently was used for launching and the balloons would go right over the house so we could wave! 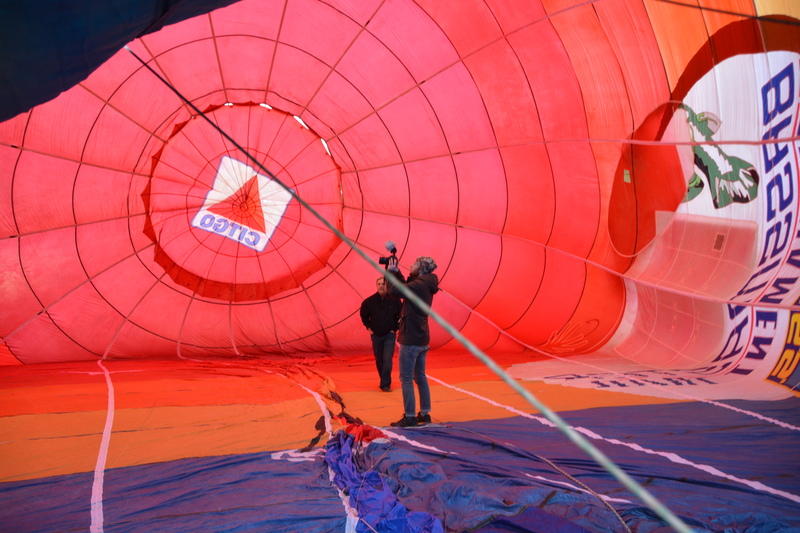 It’s also quite magical to be up in the air when there are a bunch of balloons around – David and I have some photos we took when we were flying in our plane after a big balloon rally out in the country. The whole thing is fascinating and beautiful…..hope you take a ride soon! I’d love to see your photos, Pam! The Goodyear blimp used to be parked across from my high school. On weekends we could hear the slightest sound of a motor, look up and see it fly over the house. Sadly, it was relocated many years ago to another state. Looking forward to hearing about a balloon ride. We’ve only seen the Goodyear blimp once (in person). How neat that it used to be parked near your school! Bucket list item for sure! I’m a little scared but intrigued just enough to make it happen .. someday. I know I’ll never get Hubbs up in it, though. He’s scared to death of heights. Just me talking about it makes him shiver..
What an exciting day. 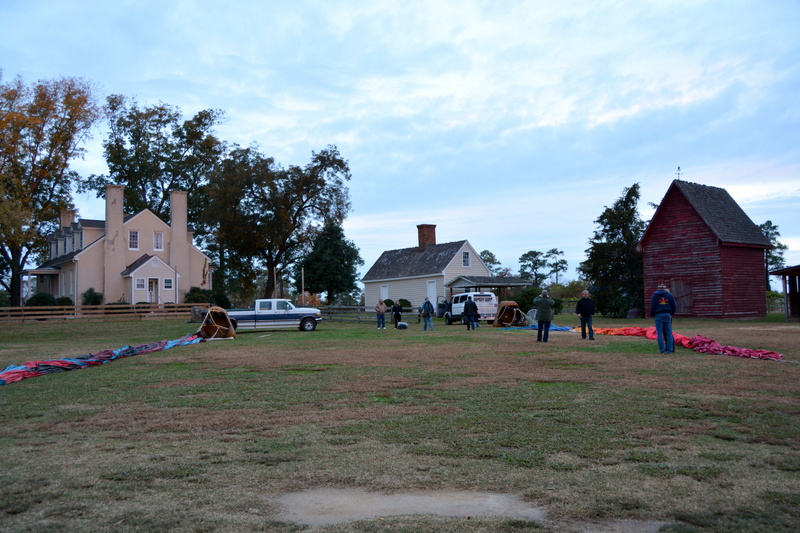 I remember one of the first IMAX movies at the VA Air and Space Museum in Hampton was a ride in a balloon. It was exciting to be above the trees, made your stomach do flips. Cool pictures Dianna! Feel like I am standing there in your third snap. 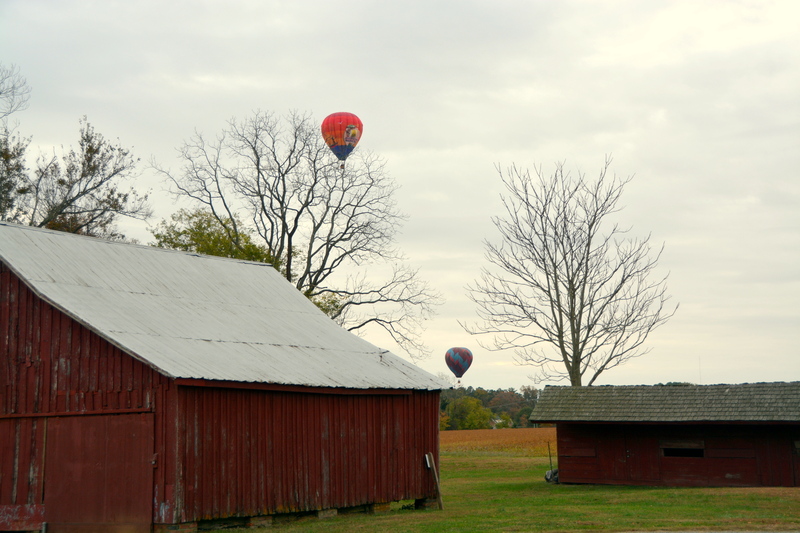 How nice that there is a sweet red barn in the balloon festivities! 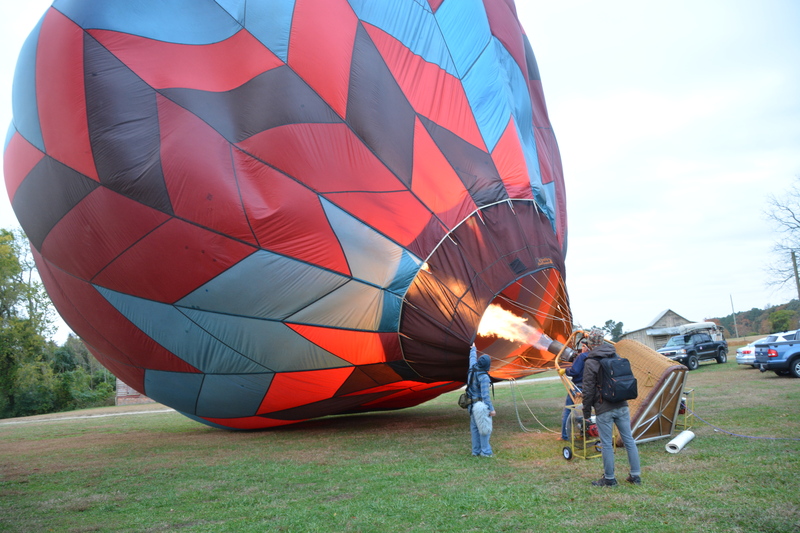 That balloon had ideas of its own and wasn’t going to wait much longer to be up and away!!! 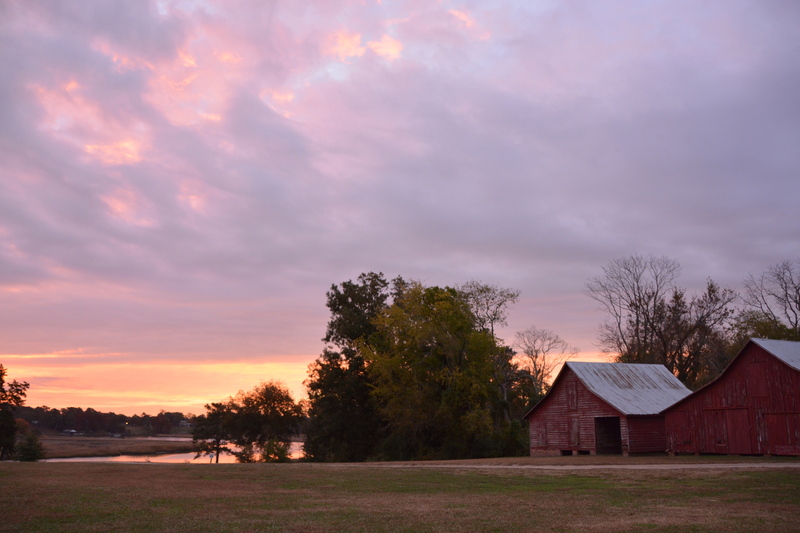 Oh, I love those old red barns. They were featured on Barn Charm once. And friends of ours are getting married in that area of the park next September! September is a most excellent month to get married! love the last shot. neat experience for both of you! Great pictures! 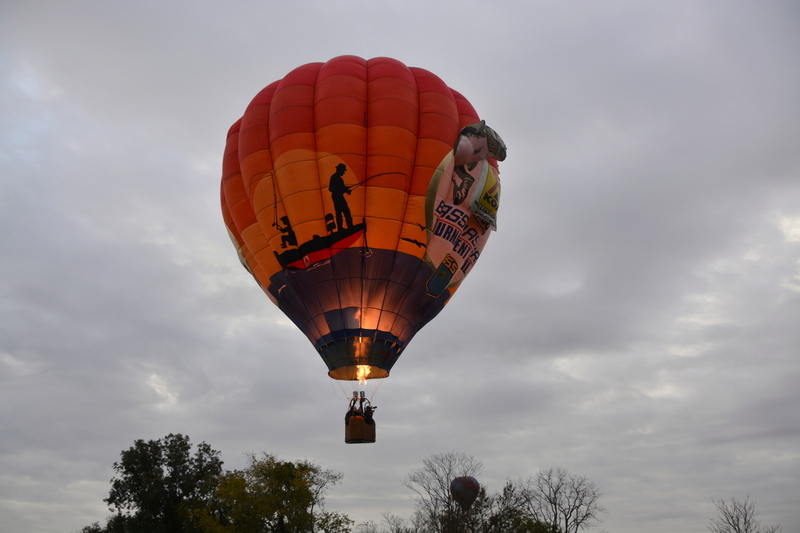 Looked like a great morning for a balloon ride! I’d get up early for that! David and I had a balloon ride on an anniversary many years ago in Del Mar, CA. It was amazing! We both loved it!! Tell JR to get that guy back here. We’ll make it worth his while! Sign us up…to go up! That was so cool!! When we lived in the Pacific Northwest, we often saw hot air balloons and we so enjoyed watching them. 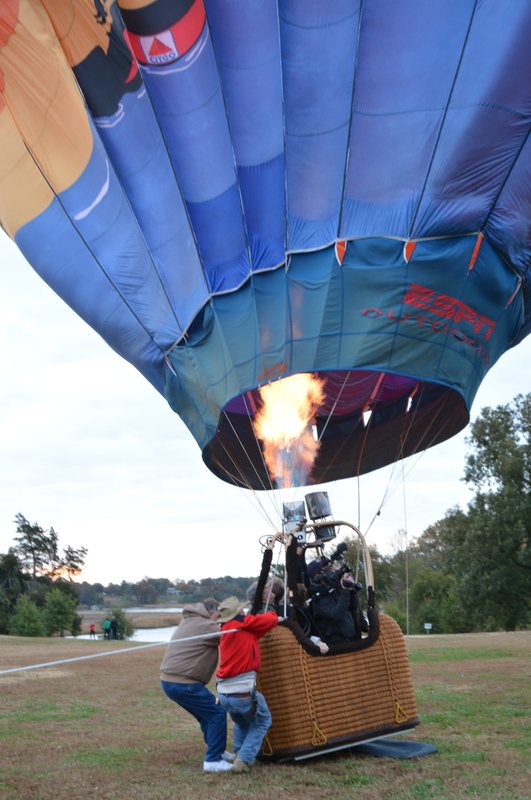 Friends of ours went up in a balloon for a wedding anniversary, a gift given by their daughters, and I always thought that would be such a neat idea. Really enjoyed your photos and can’t wait to see the ones you take when you & Motor Man take a soaring adventure in one! I’m very nervous about going, but knowing I should get some great pictures will take my mind off being nervous…. I hope! What a amazing experience for you and JR. It not only looks interesting but very pretty up in the air. Hope you and JR get to take you ride soon. I’ve never seen the process outlined before – One of these woke me up one morning as it was going over the area behind the house. I thought the neighbors were pressure-washing something at first ! Looks like it was a perfect day for a fun new experience. I bet it was exciting to be so close to the beautiful giants. Sweet! It was really fun, E. C.! go dianna, it was one of the best adventures of my life!! i have a huge fear of heights but wanted to concur that fear so badly, so i did it!! you float, you feel weightless…..i never felt fear. the view is breathtaking, an experience you will never forget!! I saw them crossover the highway on my way to work. Thought I’d have an accident trying to take a picture with my cell phone. Hope you get to go up. You’d be sure to get wonderful pics. They are beautiful to see in the morning skies. An incredible thing to watch and thank you for sharing Dianna. I have always wanted to go up in one of those and I envy you being that close to the excitement.